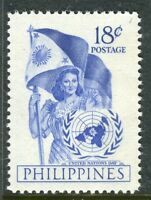 PHILIPPINES; 1951 early UN Day issue Mint MNH Unmounted 18c. PHILIPPINES; 1967 early Bataan Imperf issue Mint MNH Unmounted 20s. PHILIPPINES; 1973 early Boy Scouts Imperf issue Mint MNH unmounted 65s. PHILIPPINES; 1962 early Orchids issue Mint MNH Unmounted BLOCK. PHILIPPINES; 1949 early UPU issue Mint MNH Unmounted 4c. PHILIPPINES; 1950 early Lions issue Mint MNH Unmounted 30c. PHILIPPINES; 1960 early Olympics issue Mint MNH Unmounted 10c. PHILIPPINES; 1950 early Lions issue Mint MNH Unmounted 50c. PHILIPPINES; 1960 early Olympics issue Mint MNH Unmounted 6c. PHILIPPINES; 1960 early Olympics issue Mint MNH Unmounted 30c. PHILIPPINES; 1960 early Olympics issue Mint MNH Unmounted 70c. PHILIPPINES; 1948 early UN FAO issue Mint MNH Unmounted 6c.